View from Bimaru shewing the Pugwan Range. bl.uk > Online Gallery Home	> Online exhibitions	> Asia, Pacific and Africa Collections	> View from Bimaru shewing the Pugwan Range. Photograph showing cantonments with mountains in the distance, taken by the Bengal Sappers and Miners, an engineering arm of the Indian Army in c. 1879. Accompanying notes describe the location as 'North-west corner, Sherpore'. The Paghman Mountains (seen in the distance) are a branch of the Hindu Kush Range situated to the west of Kabul in Afghanistan. 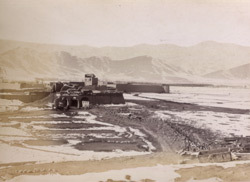 This photograph was taken during the course of the Second Anglo-Afghan War (1878-80) when British forces commanded by General Roberts occupied the area around Kabul and endeavoured to gain control of the surrounding hills. An extensive programme of defensive works was begun which included a trench wall along the Bimaru Heights, additional fortifications and new roads for the transportation of artillery. After a series of conflicts the British withdrew from the area in 1880.